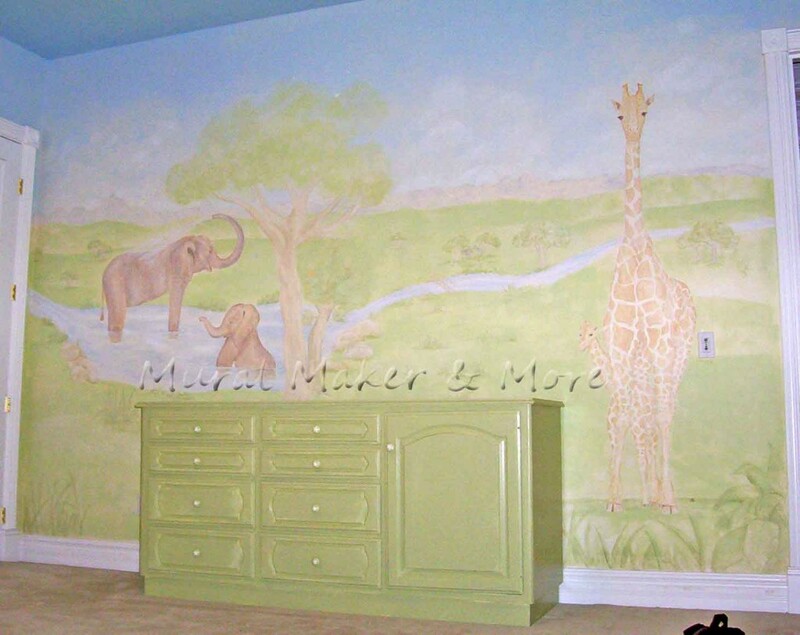 When I launched my Nursery Mural Registry, I knew I wanted to go back on local TV to get the word out to local mommies. So I called the zany fools great guys at Good Day Sacramento. One of the reporters emailed me back the next day and wanted to set up a live shot. 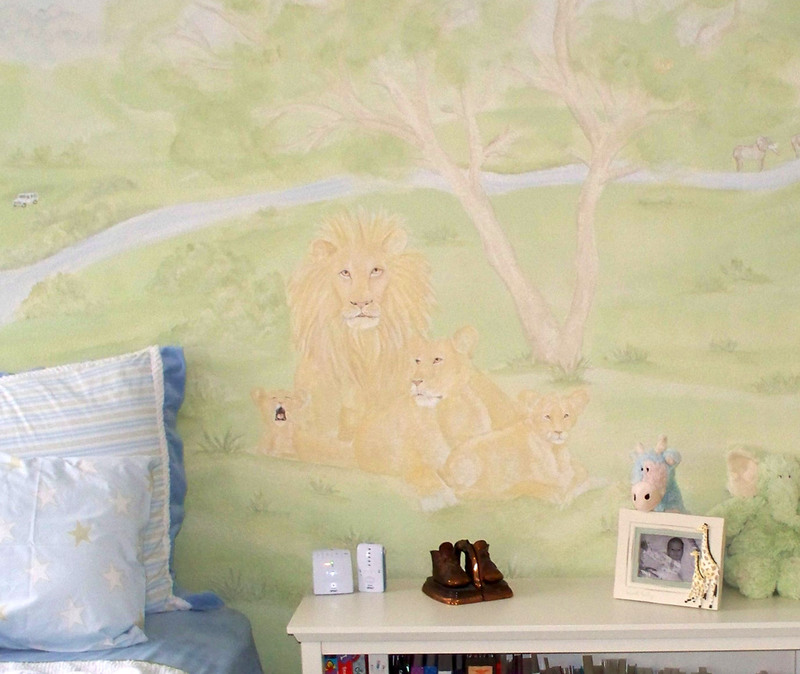 I’ve painted some wonderful nurseries in the past few years, but hands down, my favorite, over-the-top mural is this one I painted 2-1/2 years ago. Since I painted it before the baby was born (he’s now 2) the furniture wasn’t installed – just his fantastic crib. Above the crib are leaping dolphins and a plane zooming thru the sky, spelling out the baby’s name in the airstream. 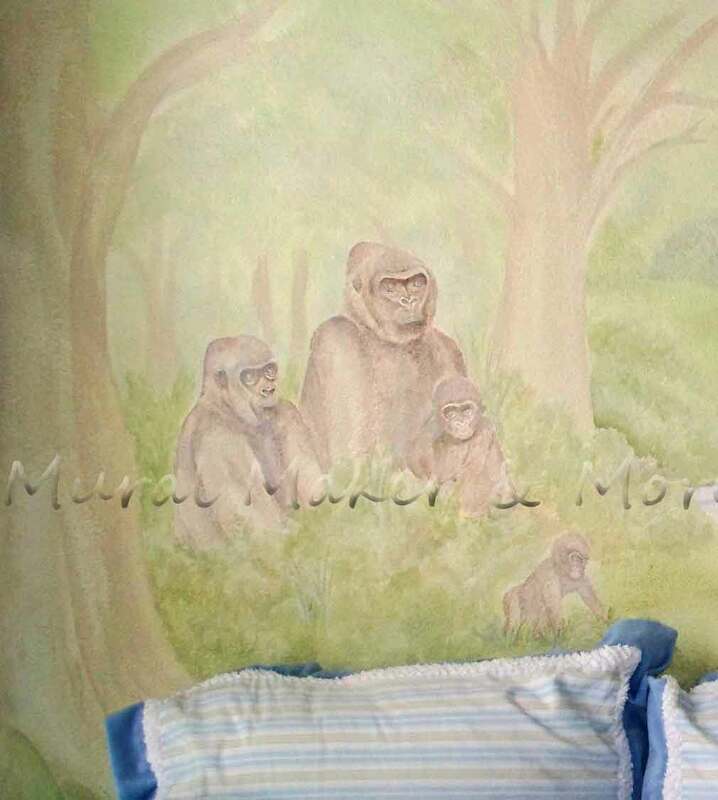 You’d never think about gorillas in a nursery mural, but these were painted in muted tones and go quite nicely, I think. Every group of animals were either families or Momma & Baby. The dresser/changing table was an old piece of cabinetry the client’s had saved. 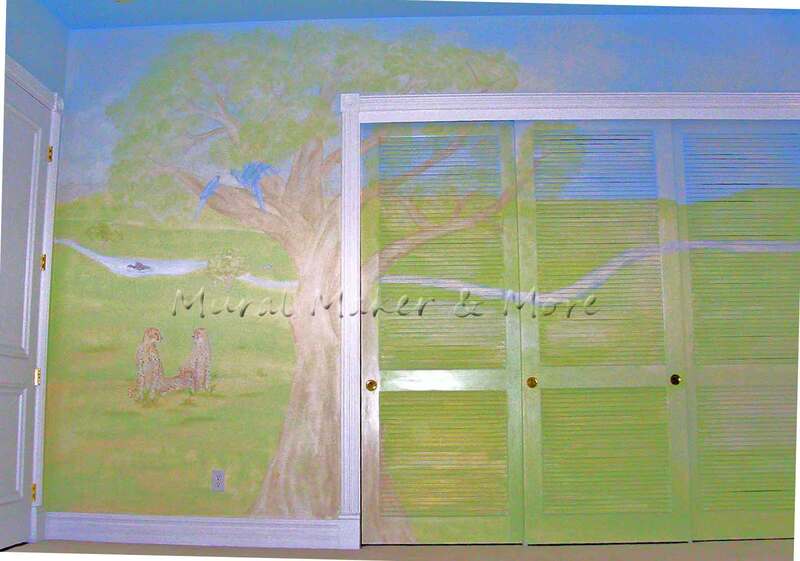 Even the louvered closet doors were incorporated into the mural. They were a bit of a pain, believe me. They had to be primed, basecoated, painted and sealed. But the effort was worth it. I’d appreciate any positive thoughts for this all coming together. I appeared on Good Day Sacramento 3 years ago – which is how these clients heard about me. I think it’d be awesome to let the local Mommies & Daddies know about the Mural Registry. However, I can also do murals on canvas and ship them to any place in the world! Thank you in advance for your positive thoughts. That mural is gorgeous… absolutely gorgeous. My husband and I desperately wanted to create a “Hundred Acre Wood” a la Winnie The Pooh for our daughter, but we couldn’t find anyone in our area to do it! I wish you lived on the East Coast! Hi, there! Thanks so much for your sweet comment. I actually did the Ariel with colored pencils. I’ve never tried painting…it scares me. Your murals are beautiful!!! Thank you, WM. Amanda, I’m going to come visit you because if you can do that (Ariel) with pencils, you can paint! Wow that is amazing! Great work! I love it! Angie, thanks for visiting! Am having fun looking at all the links on Transformation Thursday! Thank you for stopping by because I sure enjoyed returning the visit. I LOVE the murals, but I love the wreaths from the other post, too! What talent! Glad you stopped by, Judy. Yes, I love doing florals too. Especially at Christmas. Karyn, you’re too kind. 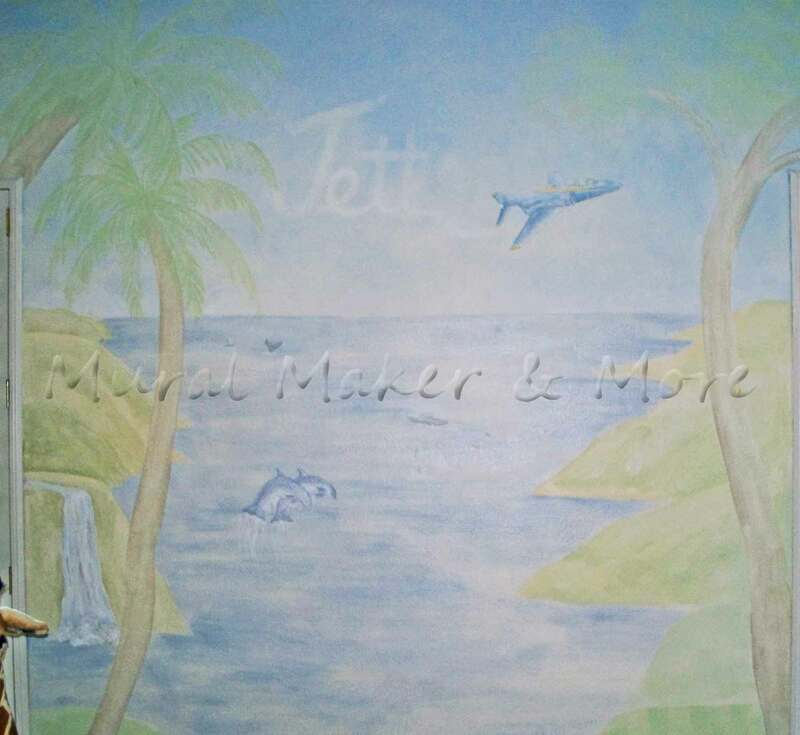 I hope you look at my work on my “real” website – http://www.MuralMaker1.com/artgallery. My full portfolio is there. Thanks for visiting! Thanks for stopping by my blog and leaving the nice comment, Colleen. Looking at your mural and can’t imagine such talent! What a steady hand you must have. Gorgeous! Wow Colleen….what a creative idea, a mural registry. I would never have thought of such a thing. Thanks for your nice words on my blog. I did my header and buttons on Photoshop. I found a digital scrapbook kit that I liked and just fiddled around with it ’till I figured it out (I’m not very techie). Great mural, you have a great talent! Thanks for stopping by my blog… you have a happy new follower! Very beautiful work, I was just a tad disappointed I wanted to see a minkey hanging from a tree maybe with a baby attached, but no monkeys all else is great and love the closet doors!